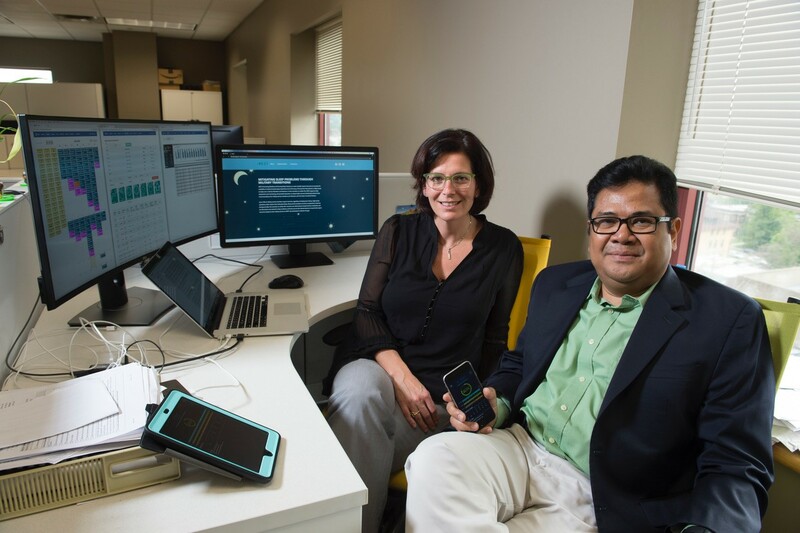 Anne Germain and Bambang Parmanto have created an app to deliver behavioral therapy to people suffering from sleep disorders. Anne Germain is convinced from the results of her research with active military and veterans that behavioral therapy can help people with sleep disorders improve the quality of their sleep, and as a result, the quality of their lives. The benefits to this are obvious for active duty servicemen and women to be refreshed and alert when conducting their daily duties, particularly when in combat situations. But the potential applications extend to anyone suffering from poor sleep and the resulting health problems and lost productivity that can be traced back to sleep deficiency. Germain has also found a link between poor sleep and Post Traumatic Stress Disorder in veterans, so improving sleep could help manage that condition as well. But making therapy accessible and affordable is an issue to its wider adoption. Germain, associate professor of psychiatry, and director of the Military Sleep Tactics and Resilience Research Team, said that she was wrestling with this problem when she encountered the mobile health platforms from the lab of Bambang Parmanto, professor of Health Information Management at the School of Health and Rehabilitation Sciences. He is the director of the Rehab Engineering Research Center on Information & Communication Technology Access, which develops mobile health applications for people with chronic disabilities. Over the past four years they have collaborated to build a mobile app, iREST, that can connect patients to therapists to allow real-time assessment, monitoring, and treatment via secure messages. Germain said that from her first contact with the Innovation Institute licensing manager Carolyn Weber, upon filing her invention disclosure, the Innovation Institute has been by her side to provide support and guidance. Germain said that several outside companies expressed interest in the iREST technology, but negotiations did not result in a license. The support from the Innovation Institute extended to assisting with navigating the Conflict of Interest process that is becoming more common at Pitt as more faculty are choosing to be involved in startups based on their research. This has continued since the license agreement, she said. She said that even after signing the license agreement, she regularly consults with the Institute’s Entrepreneurs-in-Residence (EIR) to gain insight into the commercialization process. “I’m hoping they never send me a bill,” she joked. Weber said that working as the licensing manager for Germain and Parmanto has been a pleasure. Next steps for Germain now that she is officially holding the reins of her own company is continuing to test the product with its initial customers. Her first contract is with a provider of health services to the military in San Diego. She is targeting other health care provider organizations. She is also seeking to raise capital in order to build out a team. It’s all enough to keep somebody awake at night.